I love this ducky themed celebration sent in by Yvonne! There are so many creative elements in it. I love the framed mat they had everyone sign. It is so sweet. 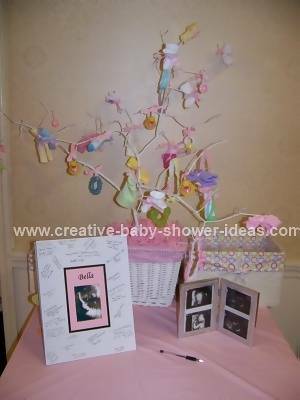 And the baby tree is one of my favorite ways to decorate for a baby shower. Great job Yvonne! Thank you so much for sharing your party with us! 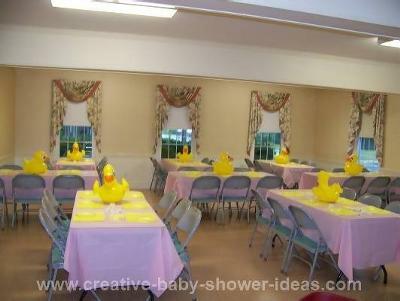 We threw a Ducky themed baby shower for my youngest daughter and used Blow up rubber duckies on the tables as centerpieces. I made a baby buggy watermelon fruit salad, and her sister created a "baby tree"! What size of a mat are you looking for? The largest that I found looking on Michaels and Amazon is a 16x20. Did you make that frame? If so, how? We plan on having a lot of people due to the fact that it's 2 families and coed so I'd like to have something bigger than normal available for them to sign on. Please advise and thanks! 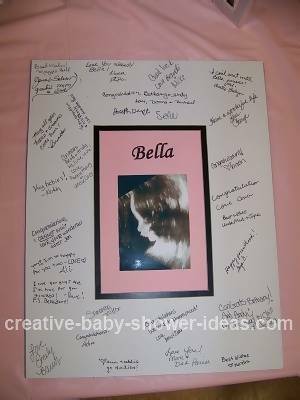 What a wonderful baby shower. 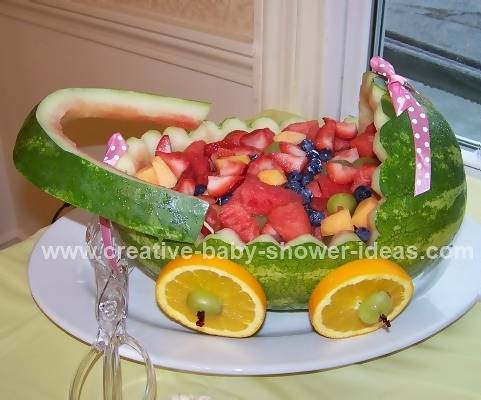 I especially love your baby tree and watermelon baby buggy! We are in the middle of planning a ducks and bubbles baby shower and I think I want to integrate those ideas into the party. This is what I have so far. I want to use yellow tulips as the table centerpieces. We are placing rubber duckies along the tables and swimming in the blue punch. We will also have little cupcakes with yellow duck and bubble sugar decorations on top. I want to make a diaper cake to match all the party colors. Along with the yellow, we using the colors of blue, white and orange for the party. I still need to figure out games, but we are getting there. Wish me luck! Thanks for your ideas.